Based on a conversation between story writer and novelist Bob Shacochis and Tom Jenks, what follows was edited and originally published by the Missouri Review in 1984. Interviewer: You came to commercial magazine publishing through the Columbia University Writing Program. Did you ever imagine, when you were a student, that in just a few years you’d be a fiction editor at Esquire? Can you tell us about that transition? Jenks: When I was in writing school there was much discussion about the efficacy of writing programs—most of it dissatisfaction. Figured on an hourly basis, we were paying tuition equivalent to the fees of a Park Avenue analyst. There was some financial aid but not nearly enough to go around, no teaching assistantships, few job prospects, and little immediate chance of publication. The news from other programs, though not printed in the AWP newsletter, was just as bad. An illustrious grad of a big midwest workshop told me, “You’re lucky you didn’t go there. The classes were overcrowded, the teachers play favorites, the town’s full of MFAs pumping gas, and it’s such a small place that before you’re through, everyone’s slept with everyone else.” That was the news on a good day. On a bad day you suddenly realized that your own writing, which you had long since reconciled as being done only for yourself, seemed absurd, awful, useless, your workshop instructor was no help at all, and your personal life—well, you didn’t have one, you had sacrificed it—and now you felt like you’d have been better off working as a sales clerk back home, or going ahead taking an MBA like your younger sister, who was already knocking down thirty thou her first year out of school. It was all too depressing even to make a story out of. Now I look around and am amazed by how much has happened to our class: Many of us have published articles, stories, and poems in big and little magazines; many have found jobs in publishing, academia, or in some other phase of the arts, such as funding, producing, or working with an older artist or arts community. Some have sold their books or signed contracts on books in progress, some have won grants and prizes, and a few have done well enough writing to live by it alone. Some pay the bills by farming or playing poker in Atlantic City, or writing TV and movie scripts or technical and ad copy. And some have given up. But mainly, what we feared would never happen but really believed might is coming to pass. We are writing, we are publishing. Interviewer: You are indeed publishing. Do you still have time to write? Jenks: I write now at odd times. An hour or two in the morning when I think I can be late to work. An hour or two or occasionally all night after the baby’s gone to bed and we’ve talked over our day and then my wife’s settled down with a book and slowly fallen asleep. Or sometimes on Saturday or all weekend stolen from what should be family time. Admittedly, they’re tired, sometimes lonely and guilty times, but they have a quality of calmness and reality that weekday, schoolday afternoons never had. And the pressure and stimulus of everything else besides writing seem to produce a deeper, more measured, textured, even if less rapid and prolific, result. Interviewer: Let me ask a hypothetical question. If I were the ideal writer, disencumbered from worldly necessities, with my goal being only to produce immortal works, what use would the “writers market” be to me? Should I even take notice of it? Jenks: In practical terms, the writing market is out there as a stimulus to imagination; really I should say markets since there are at least as many markets as personalities on a New York subway at rush hour. The man sitting next to me with his wife slumped on his shoulder is reading the morning Daily News; she’s holding a closed copy of Toni Morrison’s Song of Solomon—in Signet paper. She’s frowning deeply and seems to be in pain, but at Columbus Circle she smiles as she kisses him and gets off. He folds his paper and gets off at Times Square. Meanwhile, I’m holding an issue of The Paris Review that came in the mail yesterday. A blond kid who’s been eyeing me steps up and politely asks when and where I got my magazine. When I tell him, he says, “Dammit, mine hasn’t come yet.” He’s a recent subscriber, I think, or he’d be used to little magazines and second-class mailings. You see, I like the subway. It’s a twenty-minute ride to work, and afterward I seldom feel I have to read Publishers Weekly. Granted, a lot of what I see isn’t literary. I don’t see anyone much reading Vanity Fair or the New York Review of Books, yet I know they’re on the newsstand. The market, or markets, for writing are so vast and greedy no one can begin to fill them. There are as many possibilities as you can conceive and carry into reality. Interviewer: You’re saying that the literary market should be an encouragement, then—even to our ideal writer—by showing him or her how many possibilities are out there. Jenks: The market has always been an influence on art. Art’s aim, in part, is to transcend it, sometimes showing the market up to itself, but it’s a challenge offered by the market and accomplished only through the market. Interviewer: What about the other side of it—the normative effects? Interviewer: So again you’re emphasizing the multiplicity of the literary market—a place where writing isn’t just “sold” but sold to people . . .
Jenks: I have a friend who writes great ennui stories. Truly great. His stories are the essence of boredom, and for a time he was well known. But no one’s reading ennui stories anymore, and he can’t sell them except to little magazines and small presses and even there, he tells me bitterly, they are unattended. Some stories, like his, are artful without ever finding the right vehicle, and instead of grousing about the avarice and negligence of publishers and booksellers, my friend should probably leave his ennui stories behind and move on to fresh material. Readers will sometimes buy a book simply because it’s been published and hyped, but once they open it, they will read it only if it speaks to them. Publishing serves a double constituency, writers and readers, and tries to bring each to the other honestly. Interviewer: Writers certainly do complain a lot about this place that you are describing as so salubrious. Jenks: Of course we’re witnessing the rise of book packagers and the merchandising of book products rather than books, though there has always been the merchandising side of publishing. The most frequent and persistent author complaint is: “My book’s not selling!” The publisher has failed to merchandise it. Interviewer: What does a good editor do to sell an author? The novelist went on to tell about calling his publisher one afternoon. His editor was so looped he kept dropping the phone and having to crawl under his desk to retrieve it. Finally, he got the phone stabilized but couldn’t raise himself up off the floor. He talked like that for an hour, giving manuscript revisions. Was I interested, the novelist wanted to know, in a satirical piece on the editor? Interviewer: What would Max Perkins say? Jenks: Max Perkins, if he were alive, would be a great candidate for American Express ads: “Do you know me?” His authors did extremely well and continue to do so, and his genius may well have been in not foundering between lunches, cocktail parties, and dinners. But I doubt he’d go on TV. He felt an editor’s place was offstage, putting the writer forward. I think that’s true of most editors, even today. Interviewer: Hear, hear! A good editor is a saint. There aren’t many left. Jenks: But the real power lies with writers. Editors are conductors and occasionally transformers. Editors stand out only in diminishing subsets of the larger set called “readers.” How many general readers—the ones who recognize John Updike or Harold Robbins, readers who buy bestsellers of all types—will also recognize William Shawn or Gordon Lish? Interviewer: Gordon Lish encouraged many a struggling writer when he worked for Esquire. I assume he still does, at Knopf. He was a “conductor” almost in the electromagnetic sense—like a lightning rod for all those voices. . . . I want to ask about you. How do you decide on stories? What do you look for, and in what ways are the trends changing? seemed “experimental” or “unconventional” and whose very names sounded testy—Spike, Deck, Simckes, Reinbold, Gangemi, Hutton, Wiebe, Keeble, Carver, Ohle. Their concerns were to define contemporary fiction. “They distrust logic,” Gordon wrote in 1971, “indeed they distrust language, at least in so far as it may serve as a medium for ‘meanings’. . . . So instead of using fiction as a vehicle for communicating an idea, fiction now becomes a vehicle for conveying a feeling. . . . Hence, the principle elements in a piece become tone, mood, atmosphere, style, color, form.” These writers carried the day for at least a decade and have continued in many cases to produce significant, groundbreaking work. At Esquire, Gordon signed his memos “Captain Fiction,” and clearly he was at the peak of a period or movement in fiction and spoke with exuberant authority. But now, coming out of the ’60s and ’70s, fiction—as represented by young writers like Richard Ford or Tobias Wolff—is moving more toward coherence and a weighing of values in life and literature, not necessarily values moral or redemptive in the churchy sense, but certainly positive and negative values that can be measured in a world of meaning. I agree with Gordon that to the extent any fiction is lyric and authentic, it is felt. I look for that, next also for coherence, narrative, and meaning as it relates to a world beyond the confines of the story or its author. When I read professionally I’m guided first of all by my own ideas and taste, then by my sense of the magazine’s image of itself—who our readers are, what they expect and should be reading, what of the world we can bring to them—and finally by the subliminal associations that make reading so unpredictable. I look for voice, language, characters, story, and thought, in that order, the order in which a writer usually shows what he’s about. When the signs are clear, which is not to say simple, I begin to think I may have found a story. Sometimes it’s by a name writer we’ve been dying to bring to the magazine. Or it’s a discovery. Or it goes back and forth in the mail until after many revisions, it’s suddenly there. Sometimes we buy it and, later, it turns out to be a disappointment. We’ve erred, or for some other reason (space, timing, policy or staff changes) it never sees print. Sometimes we work on a story but don’t buy it, and it goes to print elsewhere. And that’s satisfying. Interviewer: How often does this back-and-forth occur? How often does it result in a story that you buy? Jenks: Fairly often. In the past year we’ve bought several stories by both established and relatively unknown writers that resulted from collaborations between writer and editor. In one case, an upcoming story titled “Heart Songs” by Annie Proulx, the manuscript went back and forth at least a half dozen times over a period of months before we were able to get the characters, action, and ending to work just the way Annie wanted. In another instance, “Bess” by Jayne Anne Phillips, which appeared in our August 1984 issue, we carried on a long and important exchange on cuts, revisions, rewriting, additions, to discover how this piece—originally intended as part of her novel Machine Dreams but deleted for reasons of narrative strategy—might work best as a short story. In such cases, the editor’s job is not so much to alter or tailor the story to suit a format or a magazine’s idea of a story (though sometimes that, too) but to understand the writer’s intention and point of view, and to participate with the writer in achieving maximum authority for the story. It’s a process carried on with many writers at various stages in their careers. Given that a magazine can buy only a small fraction of the fiction it receives, fiction editors will usually be very long on encouragement and assistance whenever it’s needed or requested. Also, we often help new writers find agents and book publishers, and one magazine often receives stories or introductions to writers from editors at another magazine who feel the writer’s work would be best suited to a particular editor or magazine. We try to operate within a network of goodwill. Interviewer: What part do universities and writing schools play in this? Jenks: In fact, most writers between the ages of eighteen and thirty-five have studied or taught in workshops. New York, to a surprising extent, looks for guidance from the men and women who screen writing school applicants and help advance students in the literary world. Fellowships, grants, awards, small press publications, teaching and honorary positions are all part of getting ahead. Very few books by very few serious literary writers are commercially successful. Mailer, Roth, Oates, Updike, Vonnegut, Styron might be a list of bestsellers, but what about William Gass, or Wright Morris, or Cynthia Ozick? Where are their smash bestsellers? Only as academic credentials are published novels, short stories, and poems anywhere near profitable on a more or less regular, dependable basis. Interviewer: I would certainly have had to give up the game long ago if it hadn’t been for some of those forms of patronage. Jenks: Max Apple, a reasonably well-known writer and teacher of writing at Rice University, jokes about commerce and writers’ poverty. A story in his new collection, Free Agents, takes the form of a prospectus and share offering in Max Apple, Inc., PC. One of the corporation’s assets is a friend he’s been jogging with for years, another is health. If the corporation holds up long enough, there should come a dividend. Interviewer: What does Max, Inc., most need to realize a good return on investment? Ambition? Jenks: Ambition is no guarantee of success. Neither are talent and discipline. Most of us are ambitious, and given talent and discipline, determined to finish what we start. And by the same token, we are all met on all sides by the ambition, talent, and discipline of those others who are not so much directly in competition with us as pursuing their own interests and goals. Christ, how to get their attention, and make them listen to us and give us the love and money we so desire? Finally, questions about ambition or power—of one person’s power over another, or of corporate power over the individual—are wearying, because financial, political, intellectual, charismatic, or even physical power can be only a part of it. Nothing is accomplished by ordinary power alone. Interviewer: If ambition, talent, and discipline are merely prerequisites, what is the key? Jenks: “Writing is an act of faith. . . . What a man is, rather than what he knows, will at last determine his style. . . . Let him start sniffing the air or glancing at the Trend Machine, and he is as good as dead, although he may make a nice living.” So wrote E. B. White in 1957. It’s still true. Interviewer: Let’s turn to magazines. You say you are guided by Esquire’s image of itself. What shapes a magazine? Jenks: Style in magazines, especially big magazines, is a combination of form, spirit, and philosophy. Form is shaped by finance. For instance, how many pages can you afford to publish? On what kind and size of paper, and in what register of pages? In what ratio of edit to ads? Spirit also shapes form. The look of a magazine often says as much, or more, than the words in it—think of Vogue, or Interview, of which one of its fans tells me, “I only read the questions.” Or can you imagine The New Yorker with photo features? Spirit is in the look and in the words, while philosophy originates in the thoughts that are the magazine’s reason for being. The more well-defined a magazine is in its philosophy and the better it puts that idea across in form and spirit, the larger chance it has of success with its content. Magazines want to be recognized—consistently identifiable to their friends and attractive on the newsstands to strangers. Big magazines tend to be specific and sophisticated in what they’re about and, therefore, require high stylization. Interviewer: What is Esquire today? 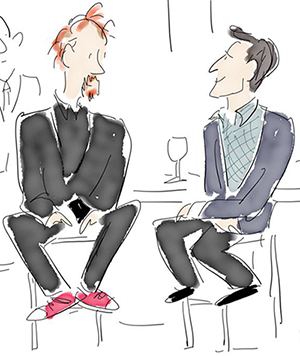 Jenks: Esquire’s style now is businessy, democratic, relaxed, and informal, with echoes of what it was in the 1950s, ’60s and early ’70s—hip, sarcastic, camp: a Cadillac convertible, “high class,” a smart go-you-one-better-than parody of swank. Many of the big magazines, like their modern readers, are projecting apparently sane, healthy, clean, positive, and straightforward “new American” images. The old smart-alecky elegance of Esquire has metamorphosed into an idea of “Man at His Best,” a contemporary lifestyle, a total approach. Our audience seems to read the magazine not so much for the voices that have been in it, or for the tone, or, I’m sad to say, for the fiction, but primarily now for the information that it gives as well as the image it creates in that informational context. Jenks: Isn’t that some distance removed from the Esquire of the thirties? Interviewer: Esquire began in 1933 as a men’s fashion magazine, and it has always included fashion articles and good fiction. The first issue contained nine short stories, including ones by John Dos Passos, Dashiel Hammett, and Erskine Caldwell. And except for the World War II period, when the magazine was celebrated mainly for its Petty Girls, Esquire has maintained an idiosyncratic literary bent and a commitment to quality fiction that was reestablished in the ’50s by editors Harold Hayes, Clay Felker, Ralph Ginsburg, and Rust Hills. The fiction policy was and is to publish “a mixture of strong stories by new voices with major work by major authors of the time.” It sounds a little like a cocktail recipe—a Manhattan, or an Old Fashioned—but really it represents a bookshelf on which newcomers like Annie Proulx and Ron Hansen stand right alongside older hands like Leonard Michaels, Harold Brodkey. . . .
Interviewer: But the quantity of your fiction ordinarily is down from what it once was, isn’t it? publishing has been that the least-read nonfiction is more read than the most-read fiction. In other words, fiction is a commercial disaster. Advertisers don’t buy ads on the basis of fiction—book publishers don’t buy ads, not even for their authors you’re publishing—and we seldom, almost never, get letters or phone calls praising, questioning, condemning the fiction we run. Yet we believe that the fiction—and especially the kind of fiction—that a magazine publishes influences its overall style and content all out of proportion to the space allotted it or the response indicated by reader surveys. Our style, no less than an individual writer’s, is a statement of faith. This past August we devoted an entire issue to fiction—eleven stories with surrounding literary features—and the response has been amazing. We’ve received more letters, encouraging letters, from more readers, and more quickly, than we have in response to any other issue this year. The few reviews I’ve seen have been good, and the early newsstand sales figures encourage me that we’ll be able to make a fiction issue an annual event, thus doubling the number of stories we publish. I can’t say that advertisers will begin to think of fiction as a good buy, but clearly there is a strong, attentive, and apparently increasing audience for magazine fiction. Jenks: Rust Hills has been Esquire’s fiction editor, off and on, for the past twenty-five years and has always dreamed of an issue devoted to short stories. Several times in the past, most recently three years ago, it looked like the idea might go over, but it never did, not quite, until the spring of 1983, when almost out of the blue Irwin Shaw, over lunch with our publisher, Phillip Moffitt, volunteered to guest-edit such an issue for us. Later, Shaw’s own work, and then illness prevented him from assembling and editing the issue as he had planned, but its existence is a direct result of his initiative, commitment, and energy. Several of the stories we eventually published in the issue—the Doctorow, the Updike, and the Salter—were ones Shaw had solicited. The rest Rust Hills and I gathered over an eight-month period beginning in October 1983. Never having done a fiction issue, we didn’t know what to expect in the way of submissions. We were a little afraid we might come up empty-handed. But, gradually, writers supported the issue and in the end made it much more of a success than we could have hoped two years ago, though not at all less than what we want for fiction, or feel it deserves. We would still like to have more pages for fiction, more room for new voices. We’re optimistic about that and glad, too, for what seems to have been a side effect of the issue: generally increased interest in fiction and fiction issues at some of the other big magazines. Interviewer: Describe for us a day at work. You ride the subway . . .
Jenks: I get off every morning at 34th Street, Penn Station, and walk a few blocks east to 32nd and Park. I take a slow elevator to 24, to what one writer described as “the ugliest offices in publishing.” She was a little let down that the place isn’t as slick as what we put on the newsstand; but the magazine itself is pretty much our way of looking good. The editorial office—a newsroom—faces west, giving us a close-up view of the Empire State Building, a long, wide-angle shot of the Chrysler Building, and on the horizon a panorama of the Hudson River and the cliffs and hills of New Jersey. Late winter afternoons, spectacular air-pollution sunsets gild the skyscrapers around us, and we’re apt to kick up our feet and daydream for a moment. Sometimes I think about Willie Morris, who before he moved away and back to Mississippi, watched these sunsets from his office downstairs at Harper’s. Jayne Anne Phillips’s new novel, Machine Dreams, was just published in the building, on the seventeenth floor, at E. P. Dutton. On 14, there’s a detective agency and a policemen’s association. In the elevator I see insurance and credit people, real estate brokers, and lawyers. We have a barber shop, a tobacco shop, and a modest bank. Nearby, there’s one good restaurant. Our neighbors are the Garment District, the Village, and Midtown. There’s inspiration in the air, and a lot of ambition. Interviewer: What’s a typical morning? Jenks: I usually begin the day by reading the mail. The majority of all stories received begins with someone waking, usually at dawn. The second most popular opening has a character buying a drink or meeting someone at a bar. Often, the two openings are combined: “I woke up this morning and couldn’t remember the bar I’d been in the night before.” Or more simply: “I woke up in a bar.” And while not many magazines will go with fantasy stories, I do see a third, fatal variation on rising openings: “I woke up this morning dead.” Between the writing of the Bible and Stanley Elkin’s “The Conventional Wisdom” there have been about ten writers to rise successfully to the challenge. Children and the children of children, everyone wanted to be told more. They wanted to be told over and over again, just three words, and they never heard enough of them. That was what I knew, had known, would always know; what I would always need; what everyone when you looked into their eyes, would always need: More of it and then some. It was a judgment and I passed it on myself—I loved my father and would not, could never, stop. However absurdly we pushed each other away or clutched ourselves together, there we were and would be, needing more. There was always that something more to be told—sometime next month, sometime next year, pretty soon—and you never heard enough of it. We were doomed and drowning. We were crying. We lived in a summer of great hope, tired, tired to death, and needy. The story is about a young woman coming to terms with her father’s remarriage and ultimate rejection of her as his daughter. “Children and the children of children. . . . They wanted to be told over and over again, just three words.” It’s a story about all of us. “Tell me a story,” my three-year-old says to me at night, “Tell me a story, Daddy.” And I tell him about Odysseus, Prometheus, and Vulcan, tell him about Jesus and Saul, Adam and Eve, Cain and Abel. I tell him fairytales, folktales, stories in song, and family stories. And he tells me about his friends, his school, the things he learns, about his toys and animals, and stories he makes up. Every day we tell each other everything we can. Publishing tries to provide a vehicle for just this connection in our lives. Even on a bad day, it’s a good endeavor.